We are pleased to herewith circulate the report for the 13th Melaka International Youth Dialogue with the selected theme, 'Youth Migration: A Step from Haven' that took place on 12th to 14th September 2013 at Hang Tuah World Heritage Hotel in Melaka, Malaysia. This dialogue was organized by WAY and supported by the Melaka State Government, Ministry of Foreign Affairs (Malaysia), Ministry of Home Affairs (Malaysia), Youth and Sports (Malaysia) and the Malaysian Youth Council. Enjoy reading and for further comments please do not hesitate to contact us. THE World Assembly of Youth (WAY) exercised its humanitarian right and obligation in response to the destruction caused by the super typhoon Haiyan which shredded the Philippines district of Leyte, Tacloban and Samar Island on November 4, 2013. Typhoon Haiyan is the second deadliest Philippine typhoon that affected at least 9.8 million people, leaving more than 659,200 people displaced and more than 10,000 people feared dead. The President of WAY, Rt. Hon. Datuk Seri Ir. Idris Haron during the WAY Humanitarian Aid mission to the Republic of Philippines meeting at the Chief Minister's office on Friday said that "WAY will channel humanitarian aids in the shortest time possible and we are still waiting for the 'green light' from the National Security Council to go there." The organization together with Mamee Double Decker (M) Berhad donated overall 5 intermodal containers of foodstuffs and vital goods. They also raised funds amounting to RM 100,000.00 to aid during this hard time. on 21 November 2013 . Interested in finding out about youth employment, unemployment, and activity versus inactivity rates for a given country? 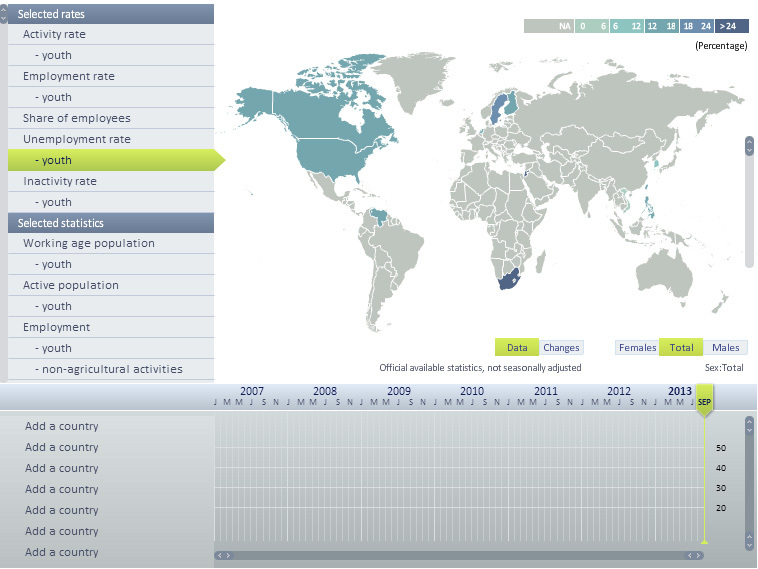 The ILO has a new database of labour statistics, including an interactive map, which provides multiple datasets with labour market statistics for over 100 indicators and 230 countries, areas and territories. We are pleased to announce that WAY shall be organizing the Youth Satellite Event themed "Youth Innovation: Ideas of Today, Realities of Tomorrow" on 12th November 2013 from 09:00 to 17:00 at the Kuala Lumpur Convention Center (KLCC) in Kuala Lumpur, Malaysia. The Youth Satellite Event "Youth Innovation: Ideas of Today, Realities of Tomorrow" aims to highlight the importance of experts and young innovators coming together to share experiences, discuss and deliberate topics and strategies on innovation for development. The event is organized by WAY in conjunction with the World Innovation Forum – Kuala Lumpur (WIF-KL) 2013. The selected participants of the Youth Satellite Event will have the opportunity to participate at the WIF-KL 2013 which is a convergence of innovative events including one on one sessions, plenary sessions, iLab sessions, satellite events and exhibitions that bring together innovation leaders from governments, industries, institutions and NGOs from around the world. We at WAY, will continue to keep the best interests of our members at hand and as such, extend this distinct opportunity to you and your friends. As Stephen Covey once stated, "I am not a product of my circumstances. I am a product of my decisions", we believe that this youth satellite event will create opportunities for young people to showcase their innovative products and accomplish their endeavors. Should you wish to partake or find out more information about this event, please do find below the concept note, detailed description and registration form for your perusal and action.